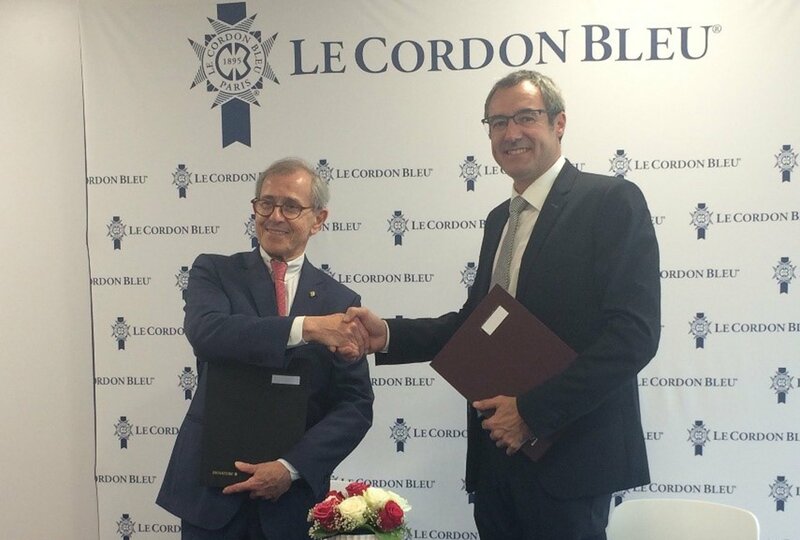 Paris, 13 June 2018 – Le Cordon Bleu institute, the leading Global Network of Culinary Arts and Hospitality Management Institutes, and the university of Reims Champagne-Ardenne (URCA), a multidisciplinary university set over a number of campuses, signed a partnership agreement on 11 June, in the presence of president André Cointreau (Le Cordon Bleu) and president Guillaume GELLE (University of Reims Champagne-Ardenne). This agreement reflects the desire of the two establishments to work together and to ensure that their respective strategies, in the field of training, publishing, and student life, are coherent. In the upcoming months, a double diploma will be created for Le Cordon Bleu Wine and Management training programme. Graduates of this training programme will, in addition to a Diploma from the Institute, be awarded a University Diploma from the URCA. Further information on the training programme: this diploma is considered to be one of the most innovative and professional programmes, dedicated to the world of wine, in France. The diploma enables students to develop a wide range of skills to assess the quality of a wine, gives them in-depth knowledge of viticulture and vineyards, managerial and financial skills, a thorough understanding of trends in the sector, and the chance to both learn about and carry out food and wine pairings. The student’s training also includes 4 visits to different French vineyards, numerous encounters with professionals and 3 evolving internships. Another development instigated by Le Cordon Bleu and the URCA will be the quarterly publication of a collection of extracts from the dissertations of Diplôme Universitaire du Gout, de la Gastronomie et des Arts de la Table (DUGGAT) students. Further information on the training programme: the two week Hautes Études du Goût is a unique and multidisciplinary programme, whose aim is to showcase the scientific, cultural, sociological, and economic aspects which make up the world of taste and gastronomy. The training programme is taught by eminent university professors and researchers (INRA, CNRS, Collège de France) and by gastronomy and food industry professionals. Other projects are also in the pipe-line as part of the alliance between the two Institutions. Initial developments will take place in 2019. A multidisciplinary university with a focus on excellence, the URCA teaches, to over 25 000 students, training programmes which are in tune with the needs of society, in all fields of knowledge, through its training programmes which are backed up by internationally renowned innovative research. A multidisciplinary University, with a comprehensive “health” training programme, the University of Reims Champagne-Ardenne is made up of 8 UFR (training and research units), 2 IUT (University Institutes of Technology,) 1 Engineering school, 1 Institute of Higher Technical Training, 1 Teacher Training College and 1 Georges Chappaz Institute of Champagne vine and wine. It offers more than 150 diplomas, from DUT (technological university degree) to PhD, and works in conjunction with local bodies in order to contribute to the development and improvement of the local area. Being spread over several sites, makes it a local university with a human touch. Welcoming and dynamic, it provides an optimum environment in which to study, experience student life and carry out research. a Human and Social Sciences division with the development of a new area dedicated to the performing arts with the creation of the Maison des sciences humaines (Social sciences Centre). With 4 graduate schools attached to the strategic scientific divisions (industry of the future and materials; bioeconomy, agriculture and viticulture 4.0; health and ageing; Human and Social Sciences), the university of Reims Champagne is outward looking, listens to both the needs of society and of its students and is at the leading edge of the latest technological innovations. In partnership with prestigious universities and national research bodies, it develops high-level research and technological or service innovations via major scientific projects, cutting-edge technology and partnerships with socio-economic players (companies, foundations, associations, communities). It also encourages the development of new topics to facilitate the discoveries and inventions of the future. Highly innovative, the Georges Chappaz Institute of Champagne vine and wine brings together academic, institutional and economic players and unites them in a common goal of showcasing the common heritage of the Champagne region and champagne.